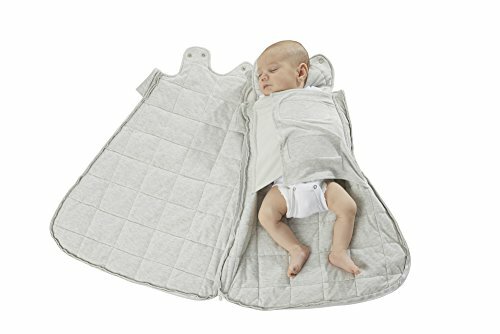 The easiest most comfortable swaddle sack provides diaper changing while keeping baby swaddled + warm, prevents Houdini breakouts, offers 5 different ways to swaddle baby + allows you to transition as baby gets older, changing sleep style. Unique safer design stays below baby's face with all-over soft pressure pts to mimic your hug all night long. In decadent, super-soft viscose from hypoallergenic Bamboo Viscose + premium fill, this feels like a luxurious down comforter for your baby. And it fits better. Gunapod with WONDERZiP ensures a better + safer sleep, easiest diaper changes, most comfortable fit + temp control zip to customize the cozy. EASIER. Change baby's diaper while swaddled + cozy with Patented 4-Way WONDERZiP. Guaranteed Easy Snug Fit every time. Super easy, No instructions needed. ADJUSTABLE. 5 different swaddling options: arms in, arms out/inside sack for warmth, arms up, arms out, converts to sack. Use it Your way. MOST COMFY. Unique design with all-over soft pressure points mimics Mom's hug all night long. Luxurious, silky soft Rayon Bamboo Duvet with Premium hypoallergenic fill feels like a down comforter, providing the ultimate sleep experience of any swaddle. Perfect for sensitive skin. SMARTER. No Houdini breakouts. Stays safely below face. Allows baby to fold legs in "M" Position with extra room. Patented WONDERZiP customizes the temp. New quiet soft velcro stays put during changes + inside sack for washes. SAFE SLEEP. International Hip Dysplasia Award, Certified Pediatric Sleep Consultant Approved, First Candle Safe Sleep Award, Exceeds highest USA, CPSIA + AAP, International safety standards. Toxin-BPA-Phthalate Free. Rigorously tested to keep your baby safe.